Sweet and sour mexican candy Lucas Muecas. 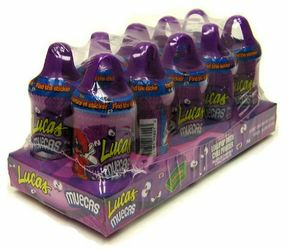 Lucas Muecas - Dulces Mexicanos marca Lucas - Paletas de Dulce con Chile en polvo Lucas. I'm addicted to these lollipops. I've tried the Lucas Botanero powders and I didn't like them at all. The chili powder inside reminds me of the original Lucas from years ago. This is real good, at first It wasn't real good tasting, but i gave it a second chance and it was real good, i bought every Lucas Muecas in the whole store!